Advertiser.ie - Letter from Ted Hughes to his brother Gerald, April 1966. Ted Hughes with Assia and her daughter Shura in happier times. 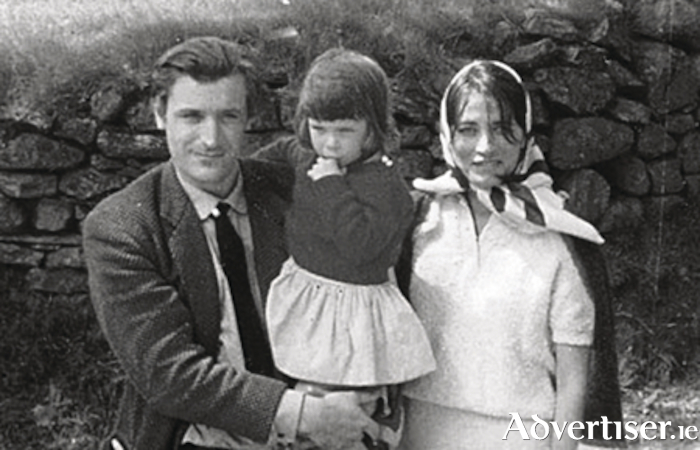 Four years following the death of Ted Hughes’ wife Sylvia Plath, he returned to Connemara with his lover Assia, his two children Frieda and Nicholas, and Assia’s young daughter Shura. It wasn’t that Hughes was particularly happy here during his first visit. They stayed with the poet Richard Murphy, sailed and fished off Cleggan, and spent a wonderful day at Coole Park and WB Yeats’ romantic Thoor Ballylee. But the relationship between Hughes and Sylvia at the time was stressed. In fact they had already discussed divorce. In the middle of their stay with Murphy, Hughes, without saying good-bye, walked away to spent time with Assia in Spain. Four months later a traumatised, and broken, Sylvia killed herself. Many people blamed Hughes for her death, and many despised Assia for her role in the tragedy. Life together in England had become difficult. Assia was still married to the poet Robert Wevill. Hughes, on the other hand, was trying to sort out Sylvia’s affairs, prepare her unpublished poetry for a book, look after his two children, and cope with the barbed comments about his reported treatment of Sylvia. Yet, despite the past experience with Sylvia in Cleggan, Hughes remembered Connemara as a tranquil place, which would allow him the peace, and the freedom, he needed to write. He contacted Richard Murphy who found them Doonreagan overlooking Cashel Bay. It was the ideal choice. Assia Wevill was born in 1927, the daughter of Dr Lonya Gutmann, and a German Luthern mother Elizabetha Gaedeke. Her father had fled the Russian revolution and settled in Berlin. However with the emergence of Nazi-Germany the family felt threatened, they moved to British occupied Palestine. Assia grew up to be a free-spirited, very beautiful, woman who was gifted linguistically. She was also an aspiring poet who published under her maiden name an English translation of the work of Israeli poet Yehuda Amichai. The poet David Wevill was her third husband. They lived in London where Assia enjoyed a very successful career in advertising. When Hughes and Sylvia were letting their flat at Chalcot Place, Primrose Hill, in 1961, Assia and her husband came to view it. There was an immediate connection between Hughes and Assia. We didn’t find her - she found us. When in February 1966 Hughes proposed that they go away together with their children, to live in the west of Ireland away from the corrosive gossip, and the blame people were heaping on them for Sylvia’s death, Assia jumped at the idea. She seemed to have been blamed the most for Sylvia’s breakdown and suicide, even though before Hughes met her Sylvia was suffering from mental anguish. Assia walked out on her husband, and embraced the new life that Connemara offered, and for a time she was happy. While Hughes worked at his poems (notably his acclaimed verse cycle Crow ), Assia painted. Frieda attended the local school. There was lots of time for walks, fishing, and family. It was to end too soon. Hughes and Assia had planned to stay at Doonreagan indefinitely, but out of the blue the house was needed, and they had to vacate. They searched for another home but did not find anything suitable. There was no choice but to return to England which Assia dreaded. Ostracised by her lover’s friends and family, and unfairly compared to Sylvia in public life, Assia began to lose her confidence in Hughes. She had every reason to fear his disinterest. Almost immediately he had an affair with Brenda Hedden, a married acquaintance, and then a young women, Carol Orchard, whom he later married. Assia felt abandoned. She had given up everything to be with Hughes; she became Anna Karenina in the tragedy that was to happen. It is almost difficult to write but on March 23 1969 poor Assia dosed herself, and her four-year-old Shura with sleeping tablets, and put their heads into a gas oven. She was 41. Even as a small boy, Hughes’ older brother Gerald, would take him out of the valley into the wild moor-lands above where they camped, and fished, and watched and caught wild animals. Hughes’ deep love of the country and fishing grew from those days. All letter quotes are from Letters of Ted Hughes, selected and edited by Christopher Reid, published by Faber & Faber 2007. ** A Lover of Unreason, by Yehuda Koren and Eilat Negev, the biography of Assia Wevill was published 2006.